This Mediterranean inspired dish is very low in FODMAPs, which makes it a perfect dinner go-to. It pairs well with either mixed greens or rice. If time allows, marinate the chicken for up to 24 hours in the herb rub to increase the infusion of flavors into the chicken; if you are in a hurry you can bake the chicken immediately. Form a paste by mixing the olive oil with the thyme, rosemary, basil, salt, and pepper. Rub this mixture onto all sides of the chicken breasts and place the chicken in a baking dish. Cover the dish and allow the chicken to marinate for 2 hours in the refrigerator. Uncover the baking dish and roast the chicken on the middle rack of the oven for 40 minutes or until it reaches an internal temperature of 165F in the thickest part of the chicken. While the chicken is roasting, in the bowl of a blender or food processor, combine the green olives, kalamata olives, roasted red pepper, anchovy, capers, and olive oil. Process it until a chunky mixture is formed. Do not puree. 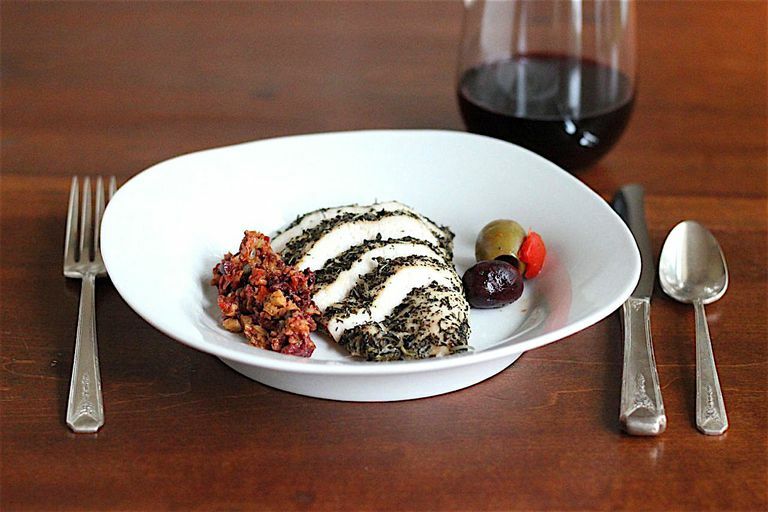 To serve, slice the warm chicken into 1/2-inch pieces and top each portion with 2½ tablespoons of tapenade. Skip the tapenade and enjoy this juicy herbed chicken on its own if you'd like. Spoon pan juices over any leftover chicken and cover tightly to keep it moist until your next meal. Extra anchovies can be frozen between two sheets of plastic wrap and stored in an airtight container in the freezer for future use.